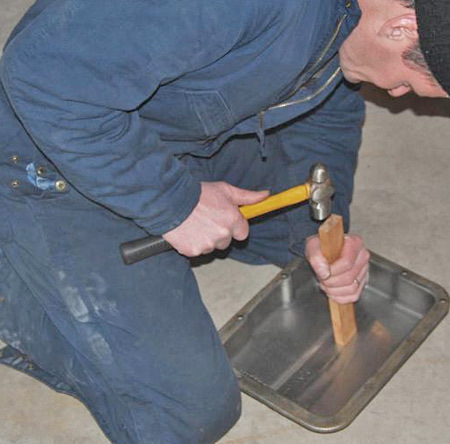 There is a science to the use of hammers when using one to restore a car. You'll have an easier, safer and more satisfying experience if you know some of the science behind the types of hammers used in mechanical auto repair work. 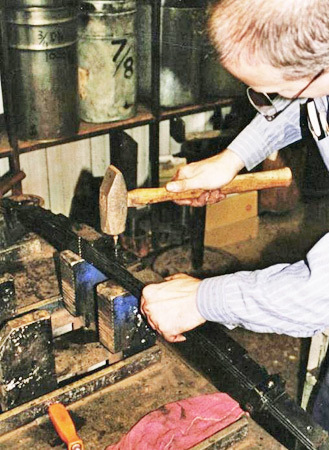 We are not talking about body hammers — the kind used to shape and form sheet metal. There is plenty of information about body hammers on the Internet. However, it also important to learn to use hammers for various repairs. 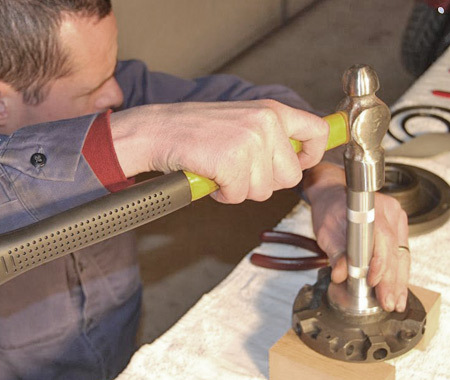 Many different types of hammers are used for auto restoration work. Weather you're rebuilding a transmission, doing chassis or brake work, making leaf spring repairs, working out suspension fixes, tackling some engine-related repairs or seating seals and bearings, a hammer is a handy tool. 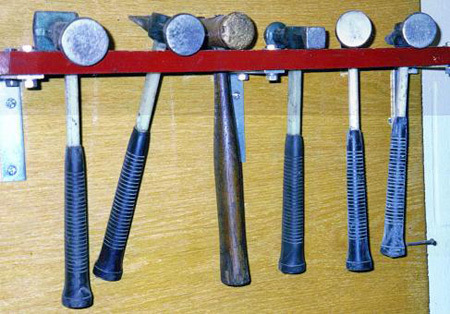 Six different types of hammers are seen here. (Courtesy Stanley Tool). Hammers come in many models, sizes and weights. The more expensive brand name hammers cost more for a reason. The best wooden handled hammers will have handles made of hickory. The heads on regular top quality hammers will be drop forged rather than cast steel. Hammer heads have different weights. For instance, you will find ball peen hammers weighing from 2 oz. to 48 oz. For automotive work, the most common weight range will be 8 oz. to 16 oz. 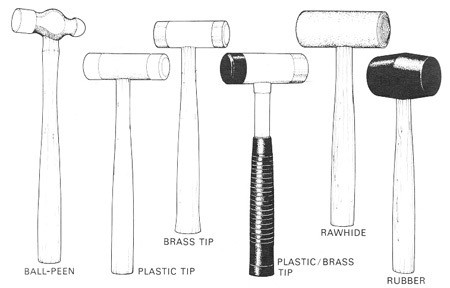 Special hammers with plastic, brass, wooden or rawhide heads (or tips) also come in handy for jobs on old cars. Another tool that finds a lot of use in restoration is the rubber mallet. You can't have too many hammers in your automotive tool collection! Most hammers used in auto repair fit into the "machinist's hammer" classification. The most common of these are the ball peen hammer, the cross peen hammer and the straight peen hammer. The peen is the shaped end of the hammer's head. On the other end you have the post (cylindrical tip) and the face (flat circular end). The peen can be used to shape metal. The word peen actually means "shaped for denting or chipping." The ball peen can be used to hammer a bolt head or nut until the metal swells and actually prevents it from jarring loose. Straight peen and cross peen hammers can swage (cold shape) metal. They are often used by welders to chip off excess weld slag. When striking a car part (not sheet metal) with a hammer, you should try to hit the part square on. The face of the hammer should be as parallel as possible to the surface you're hitting it with. This protects the hammer and keeps you from chipping or deforming what you're striking. 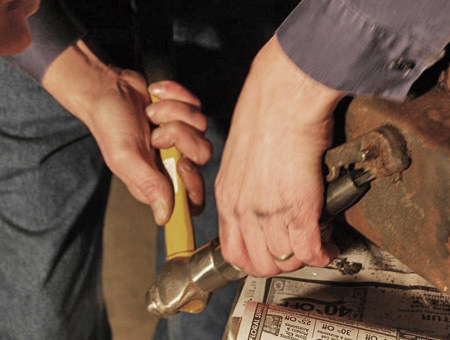 Strong, heavy hammer blows are rarely needed in auto repairs. Using a hammer that way can damage the tool or destroy the part you're trying to remove or install. Instead of banging the hammer down on a part, learn to hammer with a bouncy, rhythmic sound. Instead of "whang" you'll hear a "ka-bang-ka-bang, ka-bang-ka-bang" until the bearing seats or the tie rod comes loose. A 24 oz. 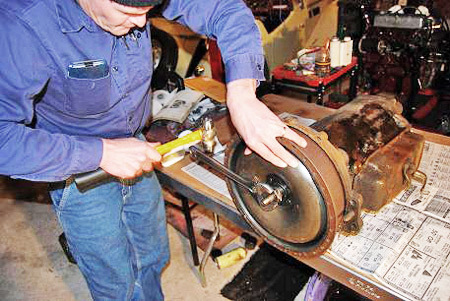 ball peen hammer and large adjustable wrench loosens the main shaft nut on an old Hydra-Matic transmission. A 24-oz. ball peen hammer and an impact screwdriver came in handy for removing front pump body to cover attaching screws in an old Hydra-Matic. When hammering to properly seat a seal, a bearing race or a slip-in bearing, you have to tap all around the part to get it to seat evenly. Tapping on just one side won't work well. 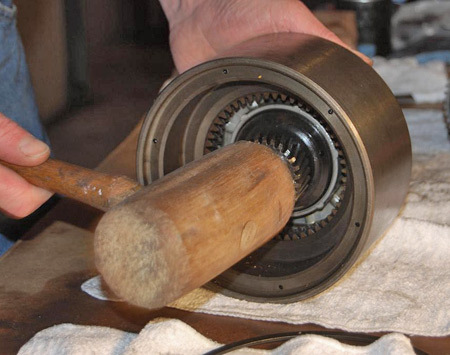 Bearing driver kits with a knurled handle that screws into flat discs of different sizes can help seat parts evenly. If the part is seating over another part, it may be impractical to use such disc-type drivers, but a socket or piece of pipe of the right size and shape will do the job. Tap lightly all around and be patient. Use of a 32 oz. ball peen hammer to tap the driver used to install a new bushing in the front transmission pump. A stubborn rusty screw in the transmission's outer shift lever was freed up using the ball peen hammer and impact driver combination again. Sometimes mechanics will use two fair-sized hammers with almost the same-size heads to break a heavily rusted part loose. They use one hammer to tap the other into the part, again and again, with a repeated, regular rhythm. Almost without fail, after a few minutes, the corroded part will break loose. 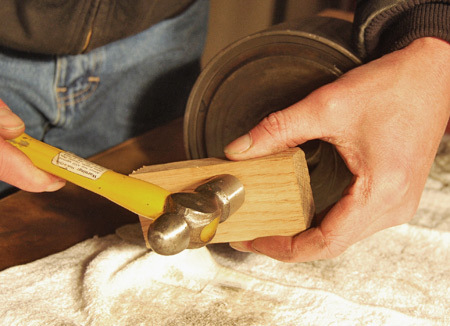 If a heavy blow is ever required, the trick is to hold the hammer near the end of the handle. Start swinging the tool with your forearm stretched nearly straight upwards and bring the face of the hammer down hard on the object. Most of the time, however, you'll want to try light blows — at least at first. To achieve this, move your grip about halfway up the hammer handle and don't raise your forearm as high. Light blows come more from the wrist than the full arm. Do not hammer with your hand any closer to the head of the hammer. This will cause you to hit the object at an angle and may pinch your hand or numb it. This wooden mallet was used to carefully tap parts into the Hydra-Matic transmission's front clutch hub. Judging from his use of an small 8 oz. ball peen hammer and wooden block, this mechanic is trying to use only light hammering for this operation. 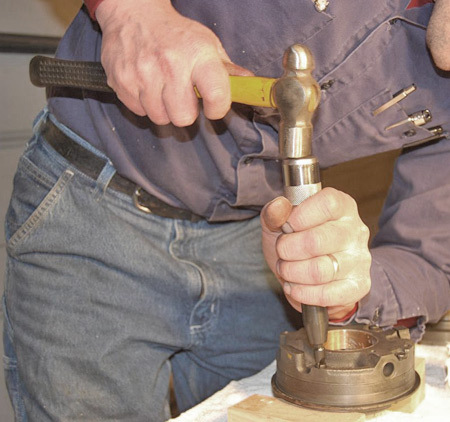 When using a hammer to strike a second tool like an impact screwdriver, a bushing driver, punch or chisel, the hammer should have a face that is at least 1/2-in. larger in diameter than the head of the tool that you are hitting with it. The use of a hammer and impact screwdriver is often required to loosen steel screws holding aluminum parts in place, such as side covers on a motorcycle engine. A nice thing to have around your shop is an assortment of different size wooden dowels and wooden blocks that can be used together with a hammer to do various jobs. We gently flattened the bottom of an old Hydra-Matic transmission pan back to its original shape by hammering on a soft wooden block held against the bottom of the pan that we moved just a little between moderate blows. Attempting to do this with only the face of the hammer would have just caused dents or, worse yet, hammered right through the pan. The use of a 12 oz. ball peen hammer and wooden block provided just enough force to flatten the bottom of this transmission pan without ruining it. 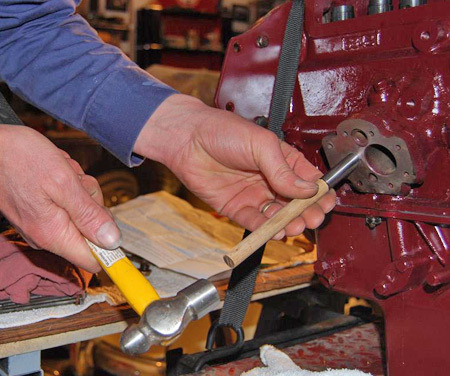 A ball peen hammer and wooden dolly allowed the oil pump tube to be installed in an MG TD engine without damaging the part. Although it's a good rule to avoid heavy hammering, sometimes you need a hefty sledgehammer for jobs like leaf spring re-arching. 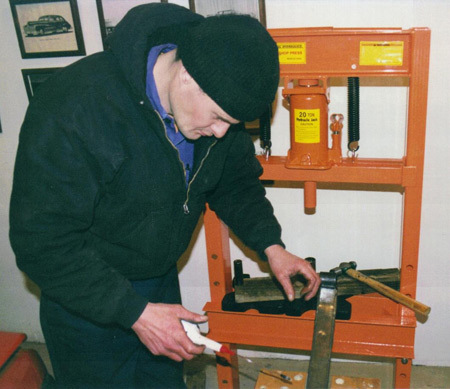 To install bushings in an MG TF leaf spring, Vince set his hammer aside and used a 20-ton press to make the job a bit easier. This is not always possible. Last year, after visiting several sheet metal fabricators, we learned the importance of having very small, light hammers in our toolbox. Several nights of "shopping" on eBay netted us a dozen lightweight specialty hammers designed for a variety of jobs from jewelry making to shoe repair. Although these are particularly useful in bodywork applications, we have found a couple of uses for them while attempting mechanical repairs. For heavy hitting — though rarely needed — we added some large hammers and sledgehammers to our tool box.